Bright and Breezy Crafts: Guest Designer - challenge 1 ! over at The Crazy Challenge! "use 3 layers or more"
and handily, I needed a card for someone who has recently passed her driving test. and hnd-drew and cut a little 'broken' learner plate. and a fancy cut bottom edge. The paper across the middle is actually from an old road map! 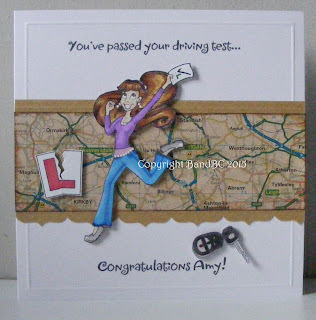 I carefully picked the area where she lives and has been learning to drive. The sentiment was printed straight onto the card. The map is the perfect accent for this image! Love the key embellishment too! Great job, nice image and the background paper is awesome. I really like the layout. Thanks for playing our challenge at Lil Patch of Crafty Friends.